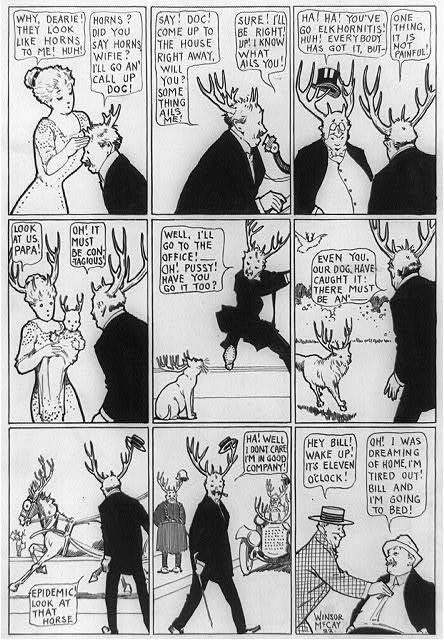 This cartoon by Edward Windsor Kemble ran in Harper's Weekly after Big Bill Taft's victory in 1908. I've been on an E. W. Kemble kick this week since coming across his political illustrations at the HarpWeek 1908 election site. Lo, the moonbats do bark. Jane Smiley's piece in Slate on "Why America Hates Democrats" offers itself as Exhibit A.
Jonah Goldberg is succinct: If you've been waiting for one writer to combine all of the sandpounding stupidity and visceral hatred of the left's reaction to "red America" this may be what you're looking for. Writes Wretchard at Belmont Club: In this account, the bulk of Ms. Smiley's enemies consist of a single, undifferentiated mass of red staters with the bestial appetites and intelligence of retarded slugs. For me the best part of Smiley's effort is when she denounces the Gadarene swine ... er ... Red State Voters…for their Manichean worldview, while at the same time insisting that the nation has been divided into the Land of Light and the Domain of Darkness. The irony of that comes pretty close to exceeding my Required Daily Allowance of irony, frankly. Roger L. Simon comments on the writer's skill as fantasist, while the Llama Butchers file the entry under "Tongue Swallowers Watch." Elsewhere, the protests have begun in San Francisco, with all that entails, and Joan Baez wins aging hippie applause for, yes, a minstrel show. Our error is that we Democrats are far less understanding than we think we are. Our version of understanding the other side is to look at them from a psychological point of view while being completely unwilling to take their arguments seriously. "Well, he can't help himself, he's a right-wing religious zealot, so of course he's going to think like that." "Republicans who never served in war are hypocrites to send young men to die. " "Republicans are homophobes, probably because they can't deal with their secret desires." Anything but actually listening and responding to the arguments being made. The essay is outstanding, and – worth noting – the blogger's first, meaning the Backseat Philosopher not only is sage, but batting .1000 on Instalanches.